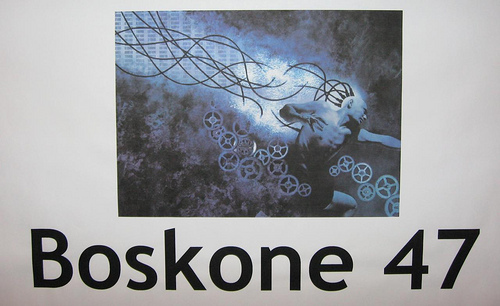 Boskone for Worldbuilders | Worldbuilding Rules! Boskone was a lovely small convention this year, well organized, low stress, and with a wide range of interesting panels & presentations to choose from. Last week, I planned to attend at least the Avatar discussion and the short fiction panel. They were scheduled at the same time! That’s convention scheduling for you: I’ve never yet been to a convention where I didn’t have to choose between conflicting panel interests at least twice a day. Being a writer, I went to the short fiction panel, but Bob Eggleton tells me the Avatar panel was much more fun than food fight anyway. I also went to a number of other presentations, and met just about everyone I was hoping to meet or catch up with, including Tom Shippey, Lois McMaster Bujold, Michael Whelan, Bob Eggleton and Marianne Plumridge, Charles and Wendy Lang, and Toni L. P. Kelner and her delightful husband Steve. Some unexpected but very welcome bonus encounters included making the acquaintance of Scott Andrews, editor of one of my favorite e-zines, Beneath Ceaseless Skies; and writers Resa Nelson and Kate Nepveu [link from Kate’s homepage to her Livejournal for some Boskone posts]. All of these folks and many other panelists and people I just chatted with, provided a ton of fascinating and stimulating discussions. I’ll be summing them up in some upcoming posts on various topics. Here’s a short list of what’s ahead, not necessarily in this order! Tom Shippey on 50 years of reading science fiction, with a special emphasis on the changing themes and subgenres in the field. Visual worldbuilding: a hodgepodge of impressions from the art show, the Harry Potter exhibition just finishing its visit to the Boston Museum of Science, and conversations with some artists at the convention. Stick around; I’ll put these posts up as quickly as I can manage in between real life responsibilities. (okay, yeah, shirking a few tonight to get this post up. But I’ve been computerless for a week, so I’m indulging myself! Thanks, Sal, for getting me back into cyberspace so quickly. And especially big thanks to my BFF Marilyn for making sure I got to Boskone this year).